Plese help me understand. If I have an entire form full of conditions and then at the bottom of the form I want to give them an option to click yes and then have the entire form duplicated right below so they can choose to order another item from the list. Thanks so much. However, please note that if there are fields that are tied to conditions, the conditions will not be duplicated along with the fields. You have to duplicate them using the Duplicate Conditions function. I thank you! this was the most helpful response yet. The thing is I'm still having an impossible time getting the conditions duplicated to the 2nd set of fields that I added after the form collapse. Are you saying that when you duplicate the conditions using the Duplicate Conditions function they are not applied to the new set of fields? If that is the case, please keep in mind that the duplicated conditions will still apply for the first set of fields. They will not be automatically changed/updated with the second set of fields. You need to manually change them to be applied to the new fields. It does no seem to have two set of similar fields. Please shre with us the URL of the form so that we can better understand how its settings are and that way give our suggestions. Hi. Here is the link http://form.jotformpro.com/form/40996045295969 I'm wondering, what is the point of the duplicating conditions feature if not that they apply to the new set of fields? Thanks for providing the URL of the correct form. I understand what you mean. However, please note that the purpose of the Duplicate Conditions function is not to apply the duplicated conditions to other fields automatically. It is best used when you want to create multiple conditions with the same rule, so you do not need to create conditions from scratch. Just duplicate the previous condition and edit just part of it, like different actions or applying it to different fields. If you would like that such capability to be part of the Duplicate conditions function, you may open a new thread and make the request there, and we will be more than glad to forward your request to our Development team. Kindly let us know once you have cloned it and if that worked for you. I hope this is what you are trying to achieve. Please check it carefully and if you need further assistance with this inquiry, do not hesitate to contact us. Wow Eliezer! Excellent! You're the best! This is exactly what I wanted! How did you do it?? I want to duplicate it another few times to give customers the ability to sell up to 5 programs. How did you do that so I can do it for my form plus duplicate it another few times? We are glad to know of your satisfaction on the solution provided by our colleague EliezerN. Now, as he had mentioned already, you can just clone his sample form so that you can make use and learn how it works more. Inform us if you still need assistance. I need to duplicate that 2 more times. 2. Apply duplicated conditions to these two new sets of fields - right? Eliezers response is very comprehensive - please have a second look on from the support forum. While duplicating fields needed for each set of fields (for additional programs) is easy using the multiple fields manager, you may have to define the conditional rules for each field manually - there is currently no way to automate this - even duplicating conditions needs you to edit the fields on which the conditional logic rules and actions will be applied. Each section (for additional programs) is hidden/shown using the principle shown in this guide. Hi! I can't for the life of mine figure out how you made it that the conditions applied for the duplicated fields the same as they applied for the original! There are so many of them it took my hours to change them all and at the end of the day they didn't work. Can you please walk me through the steps with photos? Thanks so much. 2. 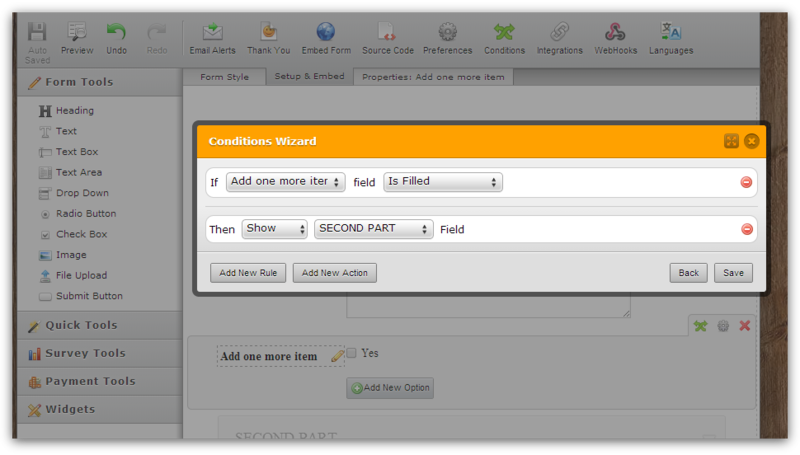 Then, duplicate all your fields you need using Manage Multiple Fields Feuture. 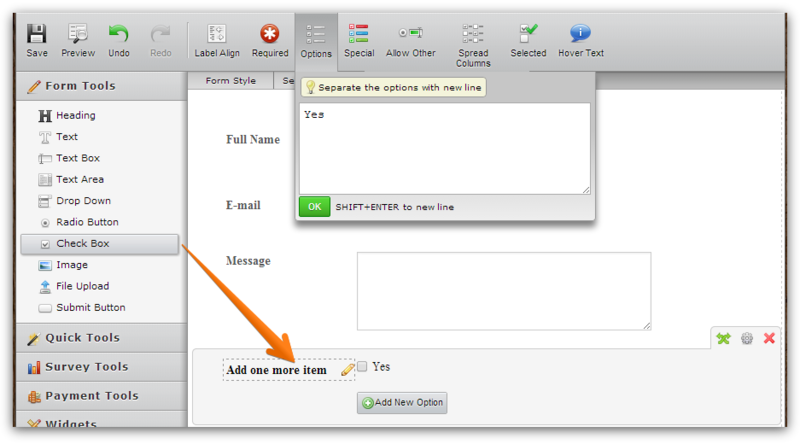 Select all your and after clicking on Duplicate button place them after the new check box field "Sell Another progam". 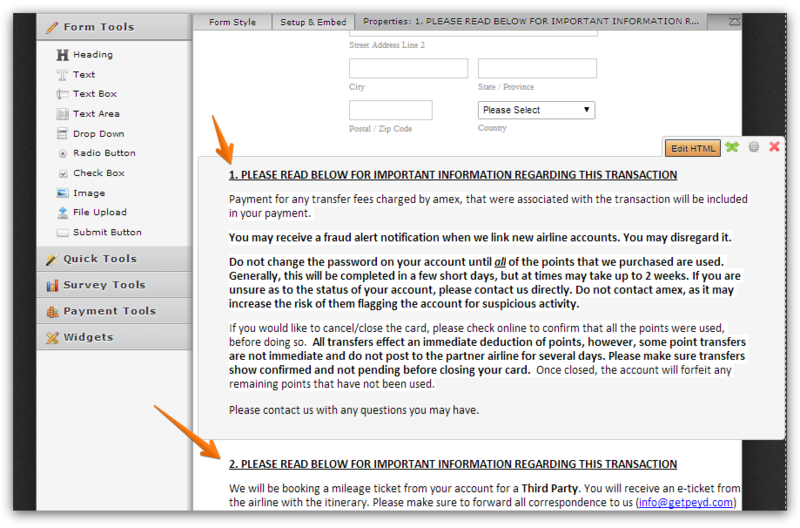 Select the fields starting with the Form Collpase "Part Two"
5. 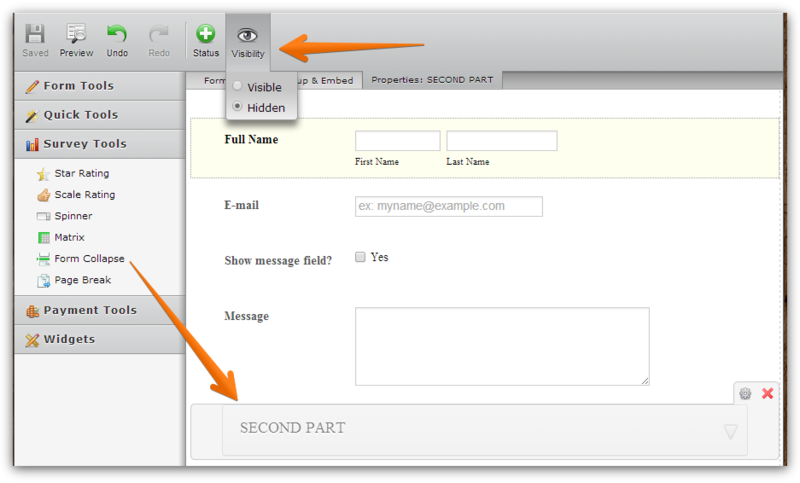 After adding numbers to the Text fields of Part two and three let's proceed to duplicate the conditions. A- Go to the Conditions Wizard to the Saved Conditions and start to duplicate them from the first at the top. B- Then, make sure to find the duplicated one, you can use the Search function of your browser for this purpose I use Chrome so I hit the keys Crtl + F to enable the search box, and once you find it Edit it by changing the current fields by the new ones. So that the duplicated conditions are not longer applied to the fields of Part Two but to the ones in Part Three. Then you have to follow the same process with the rest of the conditions and fields. This might result a bit complicated since those are a lot of fields and conditions, so if you find troubles across the way feel free to let me know and I will do my best to help you to resolve the problem. In addition and as a bit different topic, upon checking your form carefully I found that you have some fields asking for Username, Password, Credit Card information, which is not allowed in Jotform as that is sensitive information that people have to provide. Our forms are subject to review processes which determine if the form makes legal action or not, if they are found to make illegal actions, then they are suspended immediatly. To avoid that, you will need to remove those fields that request sensitive information like "Username, passwords of bank/online services accounts, Credit cards", otherwise you will be suspended by our sysetem. If you have questions about this, kindly open a new thread and post your query there making reference to this thread.